See By Such Deeds, they both received awards. (0.C.) GISBORNE, Saturday For what is probably the first time in history, twin brothers have simultaneously been decorated for gallantry in action. They are Pilot-Officer A. M. Singer and Pilot-Officer P. L. Singer, sons of Dr. and Mrs. A. L. Singer, of Gisborne. Official advice has been received that they have both been awarded the Distinguished Flying Cross. The careers of the two boys have been almost identical. They joined the Royal New Zealand Air Force in June, 1941, when 21 years of age. They completed their training in New Zealand and proceeded overseas at the end of the same year. Posted to a bomber squadron, they have latterly been flying Lancaster's and have taken part in some of the most notable raids of recent months, including attacks on Berlin, Cologne, and cities in Italy, and the great daylight raids on Augsberg and Le Cruesot. Their first tour of operations, consisting of approximately 30 bombing raids, was completed early this month, after which they were promoted to commissioned rank and went on leave. Their only brother, Surgeon-Lieutenant Hugh G. Singer, R.N., is a prisoner of war in Germany. He was in H.M.S. Gloucester when she was sunk during the Crete campaign and was one of only two officers who survived. This is the second set of twins from Gisborne who have won distinction in the air during the present war. The twin sons of Mr. and Mrs. R. L. Gray were operating with the Royal Air Force at the commencement of the war and the late Flying-Officer Kenneth Gray was among the first Distinguished Flying Cross winners from the Dominion. His twin brother, Squadron-Leader Colin Gray, won the D.F.C. during the Battle of Britain and has since added a bar. He is the leading New Zealand living fighter ace. Other awards of the D.F.C. have been made to two bomber pilots living in the same street in Gisborne — Flying Officer Neilson Williamson and Pilot Officer I. W. Renner. On March 30 the marriage took place of Flying-Officer J. B. Price, D.F.M., son of Mr. and Mrs. W. Price, Grey Lynn. Auckland, to Miss Jean Nolan, daughter of Mrs. and the late Mr George Nolan, Lincoln. The ceremony took place at St. Hugh's Church, Lincoln. The best man was Flying-Officer A. M. Singer. D.F.C., and the groomsman Flying-Officer P. Singer, D.F.C., the "flying twins" from Gisborne. "Don't let's talk about what we saw and did. There are thousands of men who did as much or more. Give the other fellows a chance!" . Thus the well known R.N.Z.A.F. twin combination, Flight Lieutenants P. L. and A M. Singer, expressed themselves in conversation with a reporter recently. They pointed out that there were aircrew members now back in Gisborne whose experiences had been more extensive and more exciting then their own, states the "Gisborne Herald." They had grown to recognise that the fact of their being twins and having had identical experiences during their service abroad might appeal to newsmen and to readers with a special piquancy. They were thoroughly "fed-up," however, with seeing their own records quoted and those of others, who had shared the same experiences, neglected. Gisborne alone had furnished scores of first-class men for the Air Force, and it was distinctly embarrassing to see the performances of these others given less prominence than their own. I see from "By Such Deeds" that they both flew for 57 squadron and were awarded their DFCs on the same day. Sadly Peter Singer died in 1953 and his brother Anthony in 1972 , both at relatively young ages. Any ideas about their training and existing relatives ? The Singers were quite a family, not only were the twins both bomber pilots and their brother Henry George Singer a Naval Surgeon who became a POW, but their father Arthur Leonard Singer served in both World Wars! I note on that page there is also a researcher, Lorraine M, who has contributed to the page that you can contact I think, so she may have more info on the family. Further particulars of the Singer twins, of Gisborne, who it was announced on Saturday have been awarded the D.F.C., were given in official advice released today by the Air Department, Wellington. From birth the lives of the Singer brothers have followed much the same course, and even the citations accompanying their awards tell of the same qualities of courage, determination, and devotion to duty. "Pilot Officer Anthony Martin Singer," the official report states, "is a conscientious and reliable captain. In the air he has always shown cool courage and resolution, and, on the ground, outstanding keenness. He has made successful attacks on the enemy's most strongly-defended targets, including Berlin, Cologne, Hamburg, and Essen, and he has also taken part in daylight attacks on Milan. He has consistently shown exceptional ability and devotion to duty and has set a fine example to less experienced members of aircrews." "Pilot Officer Peter Lloyd Singer has proved himself a dependable captain of aircraft, and has always shown great courage and devotion to duty. He has been on many operational sorties, always pressing home his attacks with outstanding courage, initiative, and determination. His great reliability, both in the air and on the ground, has set a splendid example. In October, 1942, he took part in a raid on Le Creusot, and, although the windscreen was smashed by collision with a bird and the flight engineer was injured, Pilot Officer Singer carried on and completed his mission. Within a short period, in the early months of 1943 he made attacks on targets at Nuremberg, Cologne, Berlin, and Hamburg, each time bombing his target successfully." Besides their birthday, many important, dates in the lives of the brothers coincide. In appearance, too, they have many similarities. They are about the same height, though Peter is the heavier, and both are dark, with blue eyes. They were born at Weybridge, England, on November 25, 1918, a fortnight after the Armistice, and they came out to New Zealand at the age of three. They attended the same schools, first the Gisborne Primary School, and then the Gisborne High School, and the careers they had mapped out were the same. Both attended Massey Agricultural College, and both had worked on the farm of Mr. K. Cameron, Bushmere. Their sports, too, had been similar, tennis and golf being their main interests. 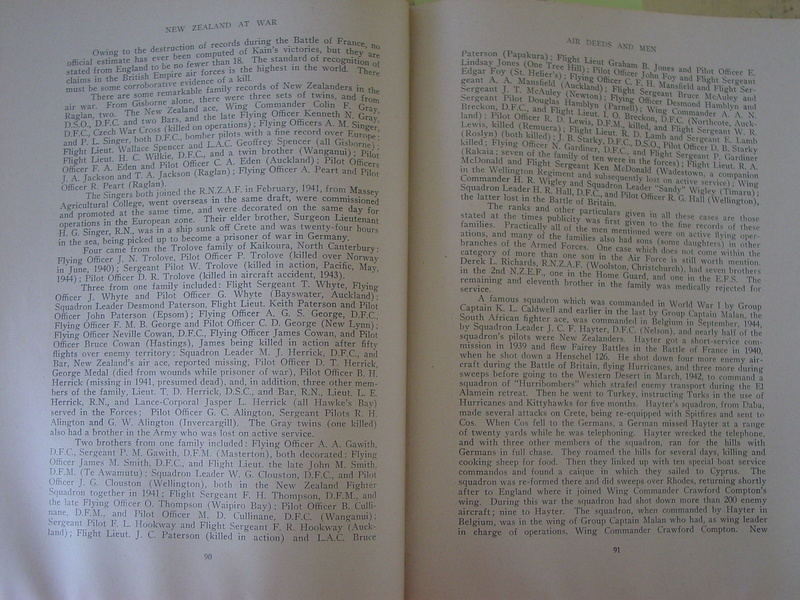 When the war came they were attached to the Massey College unit of the Manawatu Mounted Rifles, both as privates. They applied for enlistment in the R.N.Z.A.F. on October 26, 1940, and were attested into the service on February 15, 1941, after obtaining a release from the Army to join an aircrew. There were a few weeks difference in the dates of their being called into ground training school in New Zealand, but they were soon back in step to complete their training and leave for overseas together. Both were commissioned on November. 19, 1942. This may help Peter, a wedding party in the 24 March 1960 issue of Gisborne Photo News shows the best man as Tony Singer. The pride was Robin Leslie Corson. I also suspect there may be a connection with the IHC Tony Singer Memorial Pre-School in Gisborne? There are no Singers listed in the Gisborne white pages so I have emailed Lorraine M as suggested. The Singer twins trained as pilots in New Zealand, on the same course (No. 18B) at No. 2 FTS Blenheim (Woodbourne). Both arrived at this station 6/9/41, commencing with ITS two days later, qualified for flying badge 18/10/41, tfd to ATS 20/10/41, graduated and promoted to rank of temporary Sgt pilot 29/11/41 (also presented with their flying badges), embarked for UK per unknown ship approx. 18/12/41. Naturally they were allocated consecutive service numbers - NZ413490 (Anthony) and 413491 (Peter). Another well known pilot who graduated with this course was a certain John Arthur Houlton. "GISBORNE TWINS ON SERVICE: Pilot-Officer P. L. Singer, D.F.C. (left), and Pilot-Officer A. M. Singer, D.F.C., twin brothers from Gisborne, who were trained, commissioned and decorated together, photographed after a flight at an instructors' school in Britain. Thanks Dave , theres light in some of the shadows now.